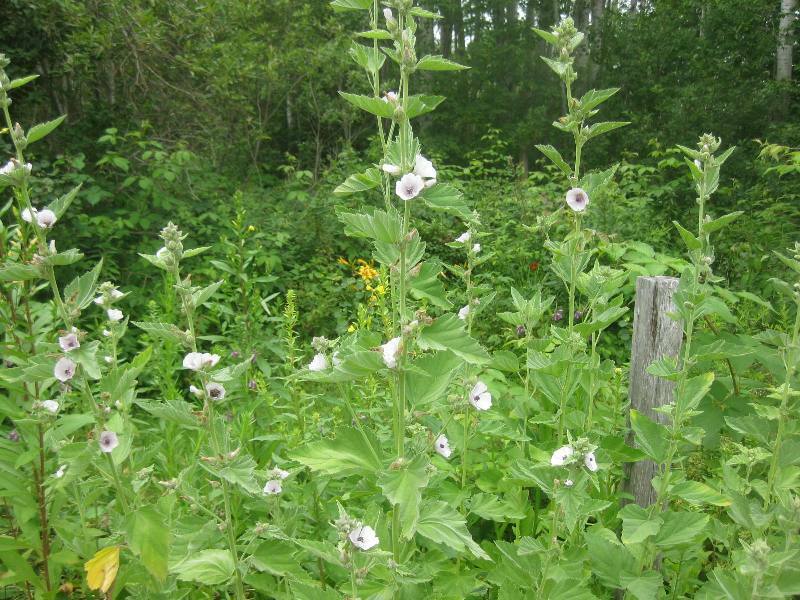 Marshmallow in an ancient medicinal herb that is a real favourite with both bees and hummingbirds. While it will not stand up to foot traffic, it will hold up well in heavy rain and wind. 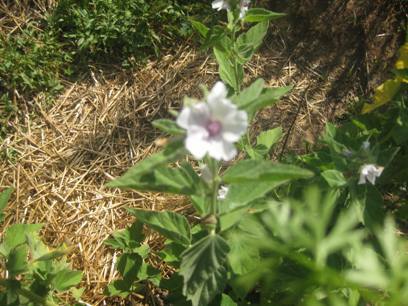 Common Marshmallow is a tall upright perennial herb plant with a profusion of lovely little white and purple flowers. It is easily started from seed and will sometimes flower in the first year if it is started indoors eight weeks before the last frost date. 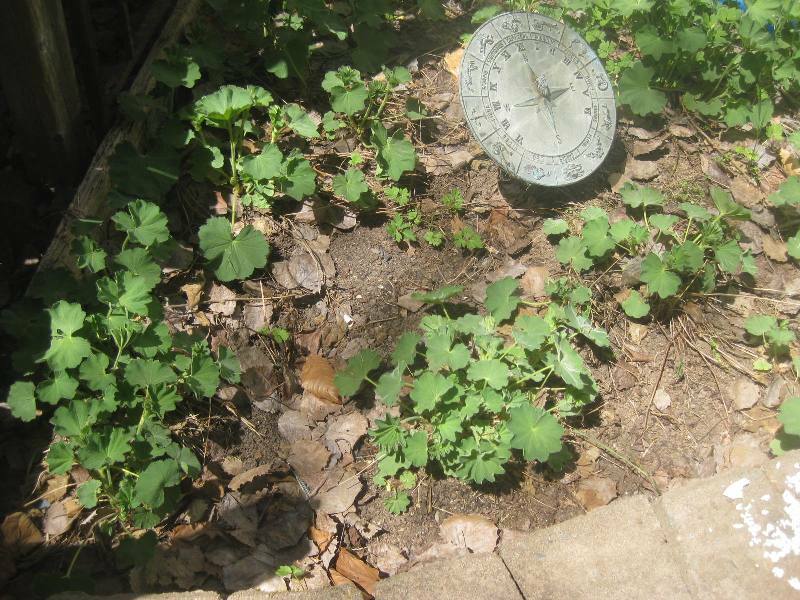 It is very hardy during its dormant stage and will even survive being tilled under. 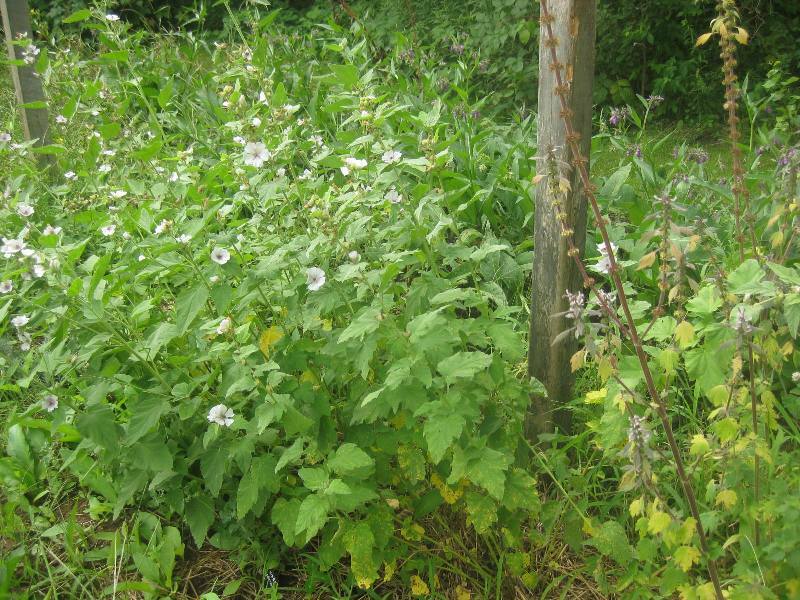 Marshmallow will hold up well in heavy wet weather but if it is trampled, the plant will not recover for that season, although it will come back the next year. During the first year Marshmallow should grow to at least three feet. In following years it can easily reach six feet in well nourished soil. Marshmallow likes full sun but will tolerate a partially shaded spot as long as it gets mid day sun. 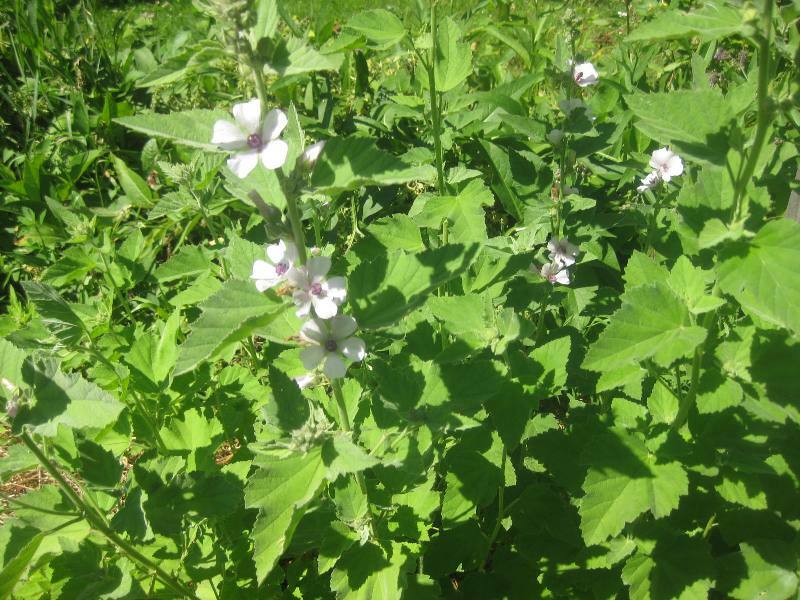 There are several different useful species in the Althaea family but care must be taken not to plant any perennial varieties too close to this variety. Otherwise it would be possible to create a hybrid of the two that would not accurately reproduce either of its parents in following years. 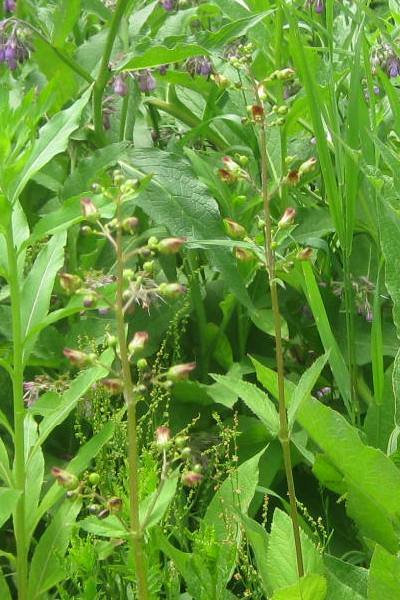 Common figwort is an important medicinal herb dating back at least to medieval times. It is native to Northern Europe and does very well here in Nova Scotia. 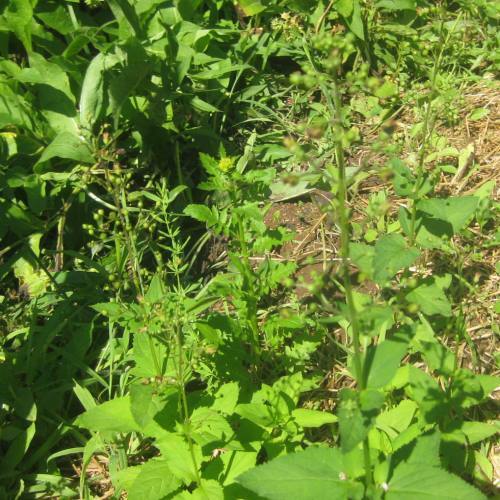 Common Figwort is in upright perennial that can reach three to four feet in height in moist semi shaded areas. Its tiny flowers form in pannicles and would be easy to miss until their brief blooming period in early summer. 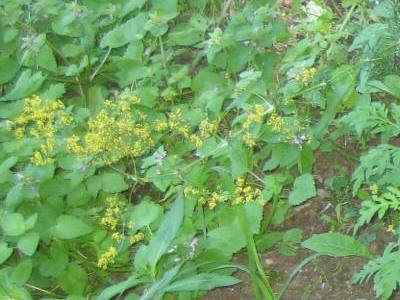 Figwort spreads by rhizomes, making it a very good candidate for naturalizing in moist semi shaded spots. 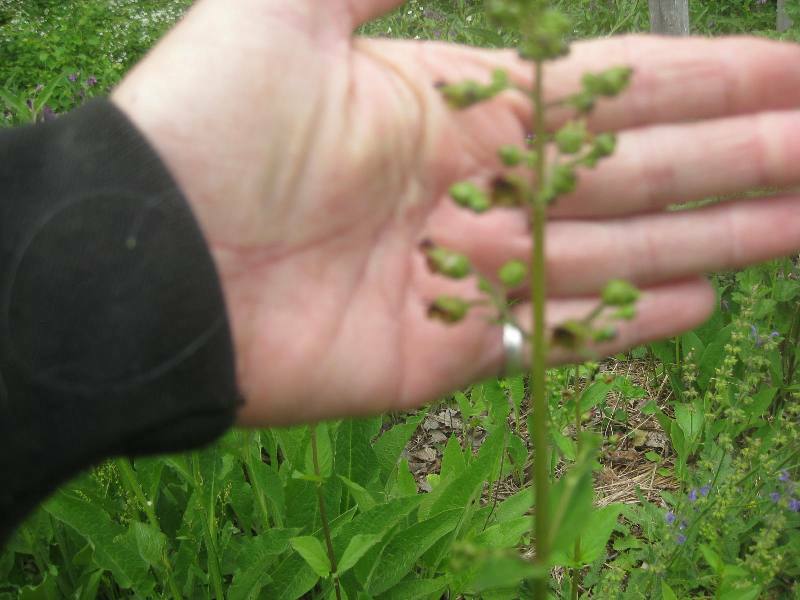 Common Figwort is easily started from seed and will bloom the first year if started indoors eight weeks before the last frost date. It prefers rich moist soil but once it is established will pop up in neighbouring fields and ditches. 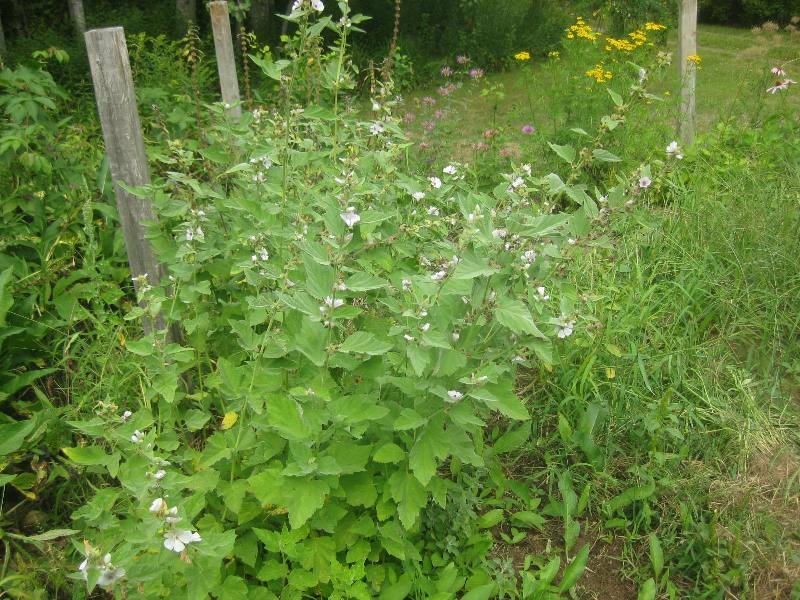 Like many perennials, figwort will benefit from being divided every couple of years to prevent overcrowding. Divisions are best done early in the spring when the plants are under a foot tall. 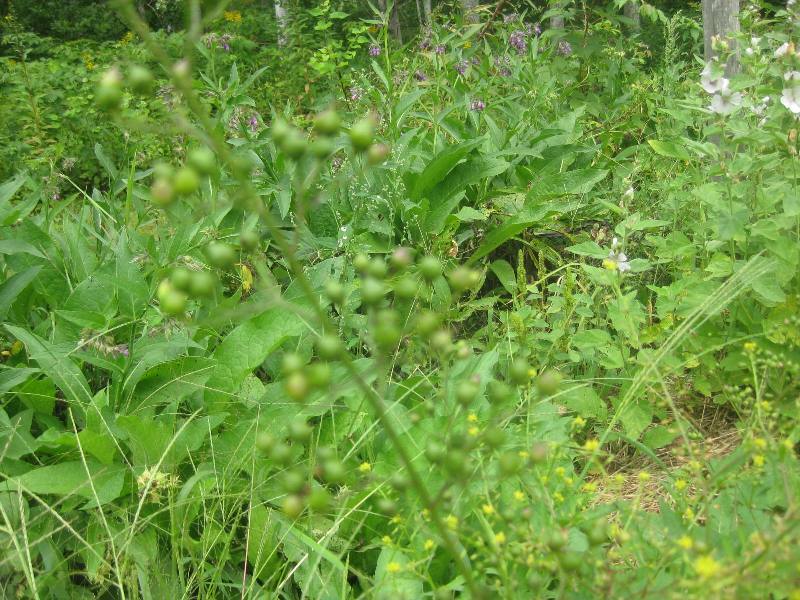 Although Figwort is not native to Nova Scotia, it does very well in southwestern areas with more temperate winters. 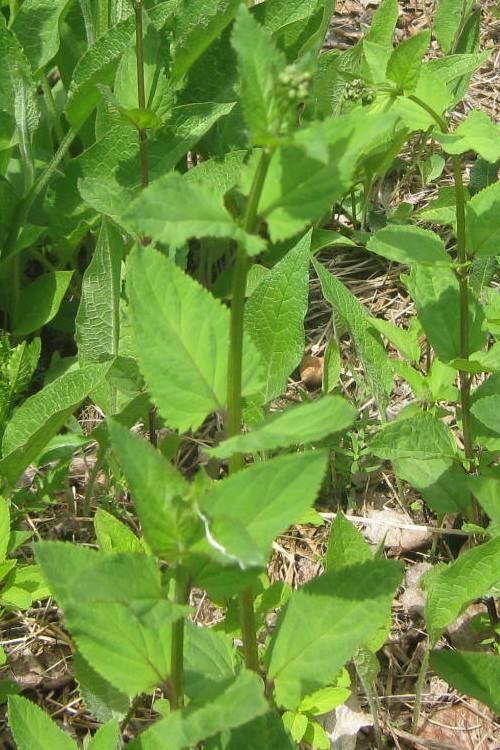 It should be noted that Figwort can be grown in colder climates as an annual, provided it is started at least eight weeks before the last frost date. When grown as an annual, the flowers should be harvested when they are in bloom in early summer and the rhizomes dug up and dried in the early fall before the hard frosts come. 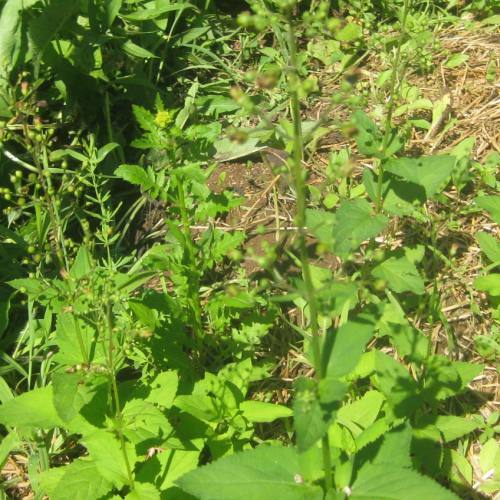 Please note that if you live in an area where you can grow Figwort as a perennial, it is helpful not to harvest any of the plant in the first year so that it can become well established. 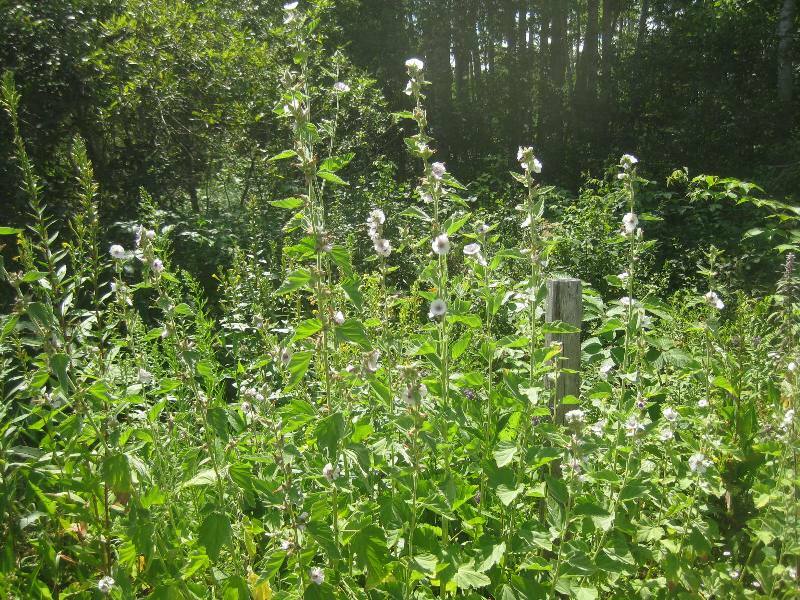 It should be noted that some of the traditional times for preserving Figwort in amulets simply are not sensible here in Nova Scotia because we have a different climate than Europe. 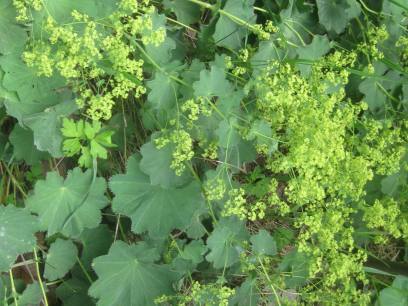 Lady’s Mantle is one of my very favourite herbs. It was a bit tricky to start but once established there has been no stopping it from popping up in every shady spot it can find. 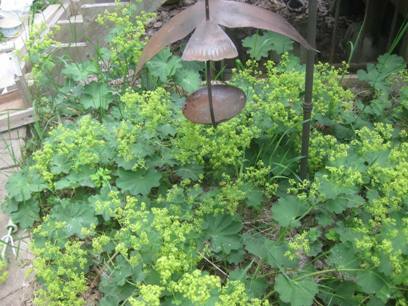 Lady’s Mantle is a sturdy perennial with unique and beautiful bluish green leaves branching out from a center stock. 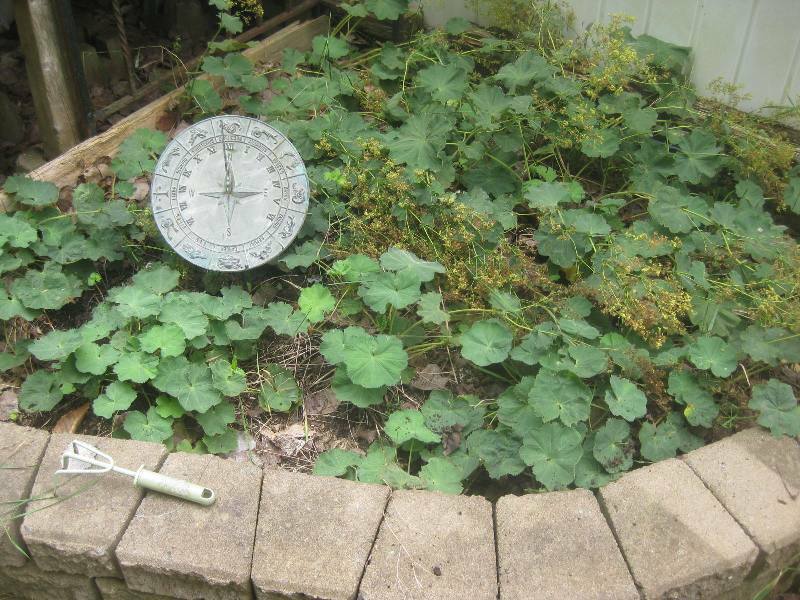 Lady’s Mantle spreads easily and in decent soil will easily grow over a foot tall. It blooms almost all summer with sprays of delicate yellow flowers. 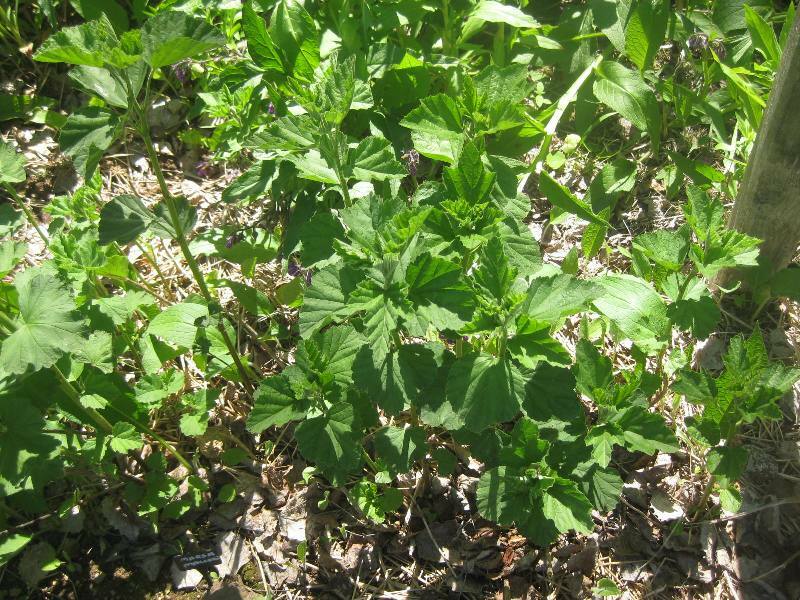 This is one of those special herbs that thrives in full shade and should be the backbone of any shade garden. 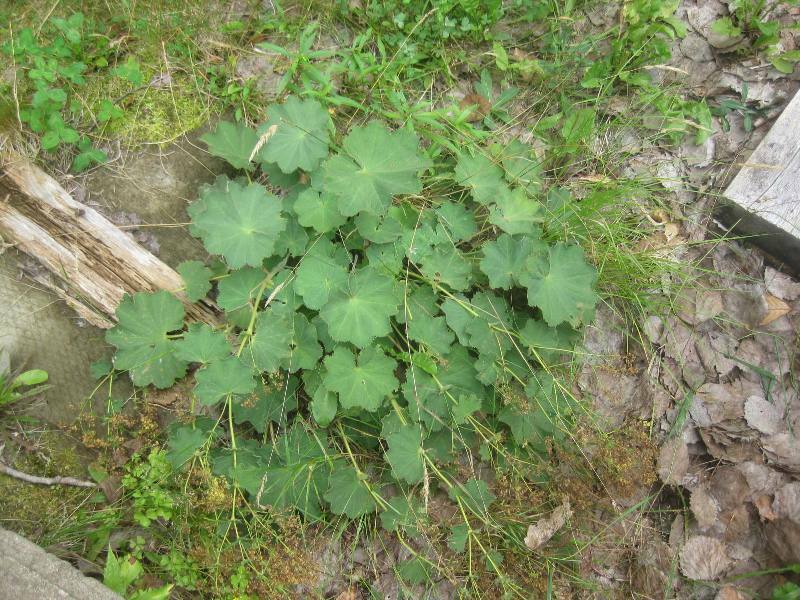 Lady’s Mantle is a perennial herb that is hardy in Zones 3 – 9. It can be tricky to start but will germinate if the seed flat is covered and tucked into the fridge until it germinates. 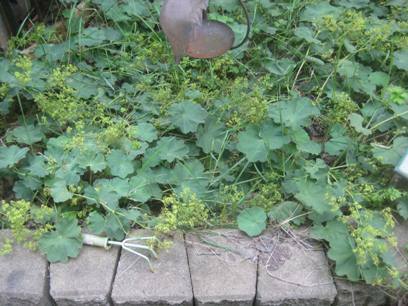 The good news is that once it is started Lady’s Mantle is unstoppable. I have found that it was best to put it in one bed by itself so that it didn’t overwhelm more delicate herbs. There has been nothing that a Nova Scotia winter could throw at it that has ever slowed it down either. 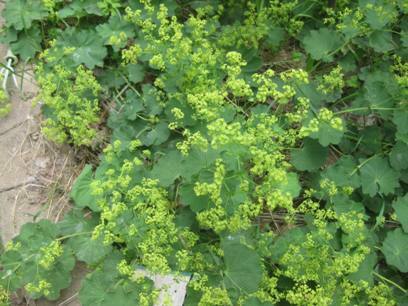 Although Lady’s Mantle has historically been used for childbirth to stem bleeding, under no circumstances should it be used during pregnancy. Please note that while there are other varieties than vulgaris, I have not found any available in either seed or plants. 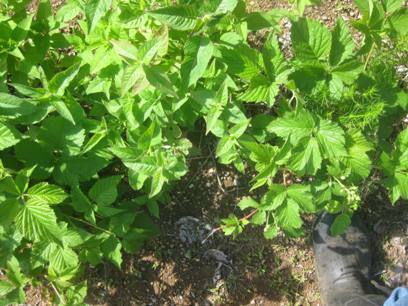 If you let the runaway popups mature each season, the plants can be harvested without decimating your herb bed. 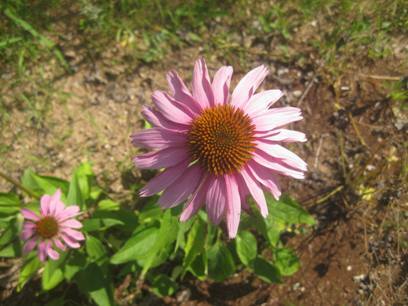 Echinacea is a widely respected medicinal herb that is native to Eastern North America. So much so that several variietes have been cultivated with the intent of improving upon the original wildflower. 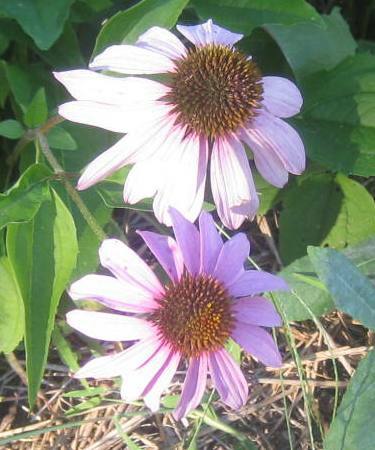 Echinicea is a tall hardy perennial that is easily grown in Zones 3 – 10. It was originally used to treat wounds. 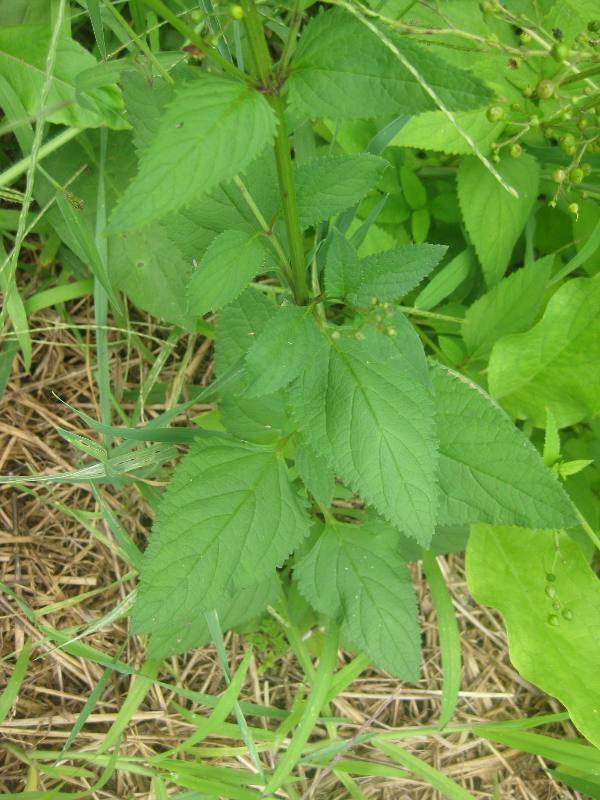 In addition to its antiseptic properties, it is also used to boost immune systems. Echinicea is so easy to start from seed that it can be direct seeded in the garden. For early indoor starts, it is best to wait until just a month before last frosts. Transplant seedlings at least a foot apart. 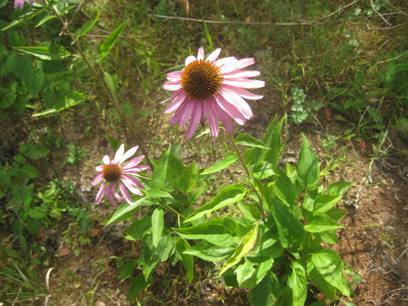 Echinacea will grow almost anywhere … from full sun to part shade. 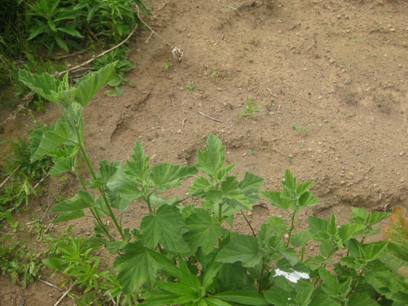 In poor soil it will reach at least two feet and in well nourished soil it can easily reach four feet. For best results, do not harvest any part of new plants until the second or third year. This plant makes a splendid ornamental as it flowers almost all summer long. For medicinal purposes, it is best to wait to harvest the roots until after the first hard frosts when the rest of the plant begins to die back.. Please note that although the crown can be replanted, the ‘new’ plant will be more ornamental than medicinal. Although this is a hardy plant, it will benefit from a heavy mulch of the straw before winter. It is not at all difficult to find Yarrow. It’s persistence is very likely the reason that it has survived from ancient times until this day. It survives regular mowing. 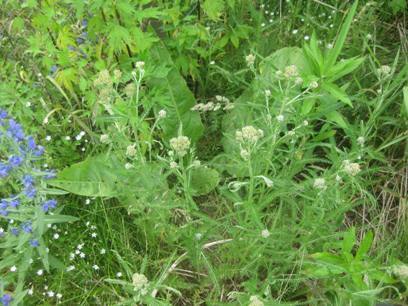 Yarrow thrives in ditches and fields. 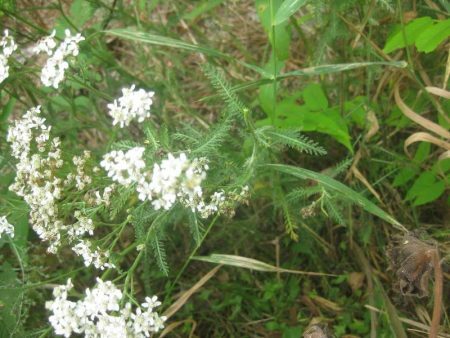 Long before there was any scientific substance to back such claims, Yarrow was widely respected as an effective medicinal herb. There could be no mistaking Yarrow. 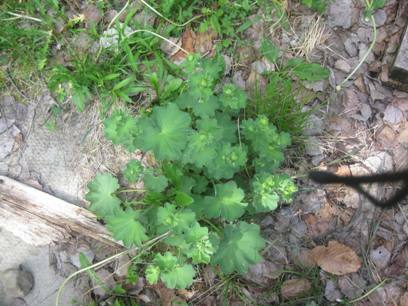 It is an upright perennial with delicate fern like foliage. Yarrow is native to Europe and hitchhiked over with the early immigrants. 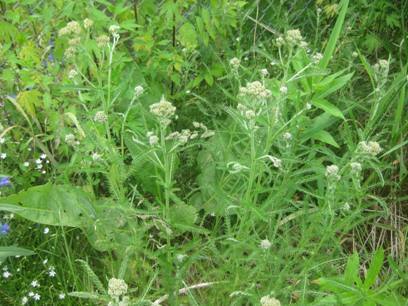 While it is not an invasive species, Yarrow has naturalized here in North America. I find that wild Yarrow usually has white or sometimes pale yellow flowers, but there are a wide range of colours in the cultivated varieties. Zone 2 and up. Yarrow will grow in any soil, but can reach three feet or more in a well nourished spot in full sun. Yarrow starts easily from seed and will bloom the first year in good ground. There is an undocumented belief that Yarrow is a great companion plant for any herb that will be harvested for its essential oils. Yarrow does make an excellent living mulch in the garden and has been found to attract the very beneficial hover flies ( look like small bees and eat aphids 🙂 It is also thought to attract predatory wasps and lady bugs. 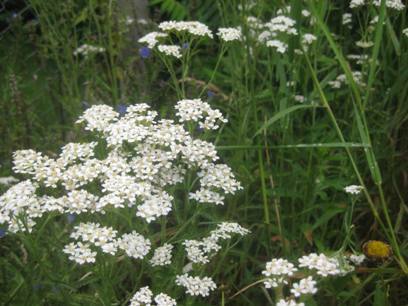 Yarrow should be encouraged because it is so useful, but can be invasive in a perennial bed. 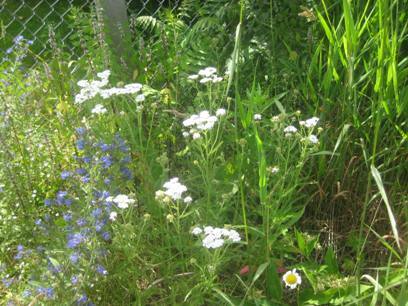 In my yard, I find it best suited to being part of my little wildflower garden. 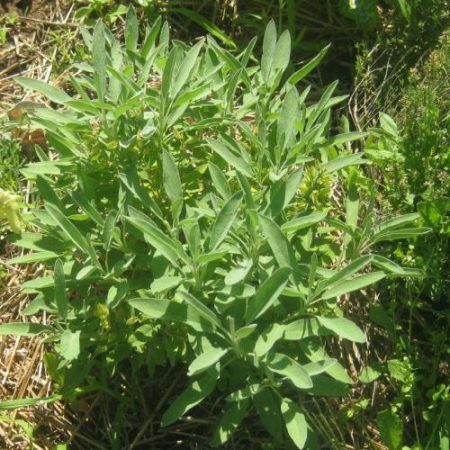 Garden Sage makes a wonderful herb to plant by your garden gate. 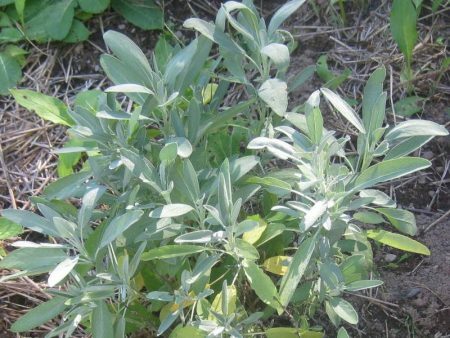 While it might not have the striking appeal of some other sage varieties, plain garden sage more than makes up for that with its lovely earthy fragrance every time those soft leaves are touched. If I didn’t have happy boisterous dogs, I would also plant Garden Sage by my front door for good health. 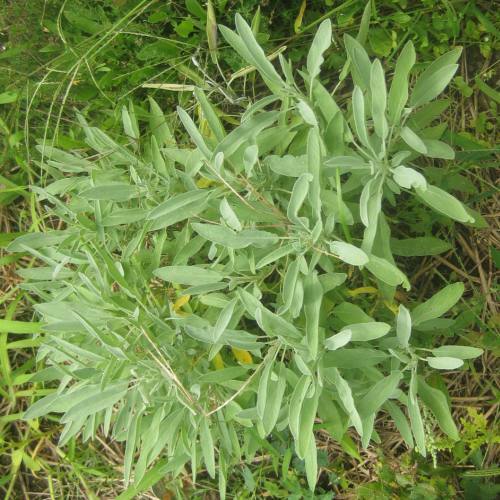 Garden Sage is a hardy perennial herb with soft velvety leaves. As it ages, the stems become quite woody but the growth remains dense and full in well nourished ground. 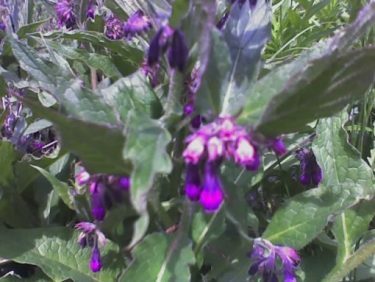 Garden Sage has a short flowering time with small blue flowers that bees are fond of. Perennial in Zones 5 – 9, can be grown as an annual in cooler climes if started indoors eight weeks before the last frost. 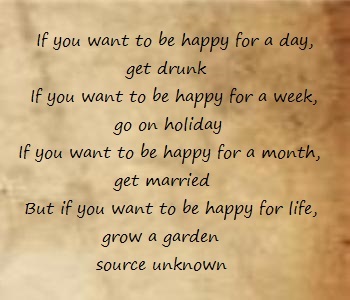 Sages of all sorts prefer full sun and are great plants for gardeners who need to conserve water. Once they are established, all sages actually prefer not to get their feet too wet. Even in milder climates, sages of any variety benefit from heavy organic mulch to protect them from cold weather before they are blanketed with snow. 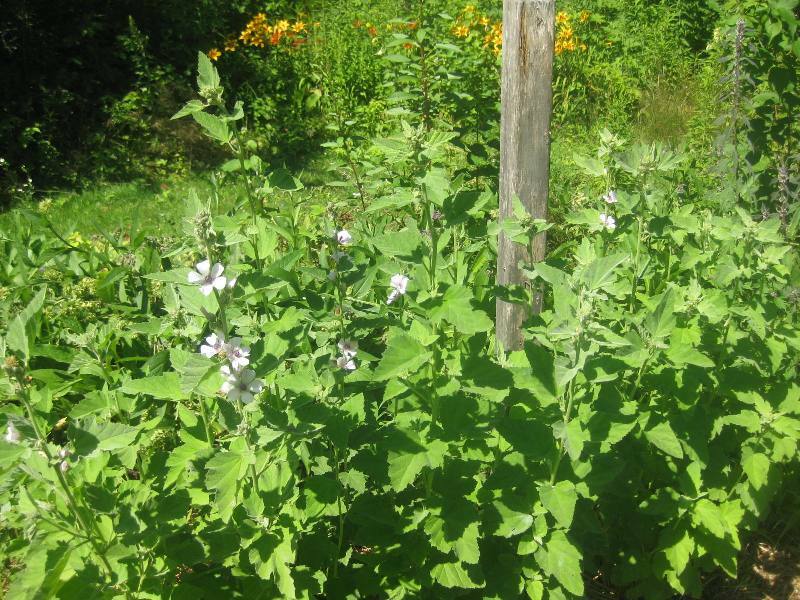 Garden Sage can be helpful companion plants for cabbage, carrots and tomatoes. Sages of any sort should not be grown near Rue or onions. Cucumbers will not do well when planted near sage. Unless one is cooking for a crowd, there is no need to harvest the entire plant for winter stores. Individual leaves freeze dry very well on trays and winter well if they are layered in a container lined with parchment paper in the freezer. Leaves can also be preserved in oil or processed in the same fashion as pesto. If one is making bundles for smudging, the plant is best harvested and tied in shape after flowering Hang individually to dry.